Justine Clarke, friend of Sing&Grow, has been found participating in the odd session this year, sharing music with families and learning more about the work we do. This month Justine visited QEC to observe and share sessions offered by our Vic/Tas Manager, Rebecca Huntley. Rebecca provides Sing&Grow music therapy 2 days a week to families visiting the QEC Residential Stay Unit. To learn more about our facility-based work like that offered at QEC, and other Sing&Grow services, click here. 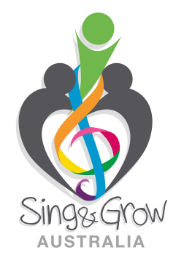 Sing&Grow is a program of Playgroup Queensland Ltd and is partly funded by the Australian Government.